Mike Ferner, the president of Veterans for Peace, was speaking outside the White House calling for a "culture of resistance" against U.S. wars. His organization was leading a protest outside the White House at the same moment that President Obama was inside announcing the continuation of the Afghanistan War. Pulitzer Prize winning war correspondent and author Chris Hedges, who has seen more war than most vets, joined in the call for action. He adapted President Obama's campaign of hope and change, urging everyone not to wait for Obama, but to take action: "Hope will only come now when we physically defy the violence of the state. All who resist, all who are here today keep hope alive. All who succumb to fear, despair and apathy become an enemy of hope. They become in their passivity agencies of injustice." Hedges urged actions, large and small, against the corporate-government's militarism. As Obama spoke inside the warm White House, outside in the snow 131 veterans and their supporters defied authorities, some chained themselves to the White House fence, others refused to leave when ordered by police. They were arrested. Many promised continued acts of resistance. Some, from other movements, like Margaret Flowers, MD of the single payer health care movement, urged solidarity as resistance is needed on many issues mishandled by corporate-government. The seeds of resistance had been planted. The watering of that seed was coming from Obama's false words and the truth escaping from his government's secrecy. He proclaimed progress in the Afghanistan War. But, the front page of the New York Times, the day before his speech, reported "two new classified intelligence reports offer a more negative assessment and say there is a limited chance of success." These reports (not released by WikiLeaks, but by the traditional leaking in DC) were from the National Intelligence Estimates which brings together the findings of 16 intelligence agencies and showed a conflict with the DoD's more rosy picture. President Obama then went on to talk about how the U.S. could begin withdrawing troops as the Afghan police were trained and took their place. But, just four days before the president spoke, The Guardian described how "more than 20,000 officers from the Afghan National Police (ANP), the country's main law enforcement agency, have left over the past year." President Obama promised to persist until the United States achieved victory, but as Daniel Ellsberg, a veteran and former military analyst for the Pentagon pointed out, General Patraeus has told the president there will be no victory. Ellsberg, reading from Bob Woodward's "Obama's War" quotes Patraeus saying: "You have to recognize also that I don't think you win this war. I think you keep fighting. . . You have to stay after it. This is the kind of fight we're in for the rest of our lives and probably our kids' lives." Again, the quote from behind the closed doors of the Oval Office came from the traditional leaking in the capitol, not from WikiLeaks. If Obama's inaccurate statements to the American people about a war costing $5.7 billion per month are not enough, you can look to the documentation of failure and potential war crimes in the WikiLeaks reports, the Iraq and Afghanistan War Logs and the diplomatic cables. They show, among other things, that that U.S. troops kill civilians without cause or concern and then cover it up (more examples of hiding civilian killings here, here and here) including killing reporters, and that the CIA is fighting an undeclared and unauthorized war in Pakistan with Blackwater mercenaries, the President of Afghanistan is not trustworthy, that Afghanistan is rife with corruption and drug dealing, the Pakistan military and intelligence agencies aid Al Qaeda and the Taliban and that the U.S. looks the other way when government's it controls torture. The cables also show that beyond the war fronts that Hillary Clinton has turned State Department Foreign Service officers into a nest of spies who violate laws to spy on diplomats all with marching orders drawn up by the CIA. All of this has the world looking at the United States with new eyes. WikiLeaks, the Abu Ghraib prison photos, the reports from Guantanamo Bay, Red Cross reports of secret prisons, intelligence reports and so many other sources of information show Americans what their government is doing. Now that we know what the government is doing in our name, Americans must take action to stop it. Knowing the truth and not acting is complicity in their actions. More and more Americans are acting. It is not only the arrest of 131 vets and their supporters that show a rising tide of resistance. We see it in the publishing of documents by WikiLeaks and major media outlets as well as in the independent media around the globe. In the more than 1,000 mirror sites of WikiLeaks set up as the original site was under attack, we see resistance. When more than 100,000 people downloaded the WikiLeaks "insurance policy" and were prepared to release documents if Assange was harmed, it was an act of resistance. It is seen in intelligence officials leaking documents to the New York Times the day before the president spoke on Afghanistan, showing the country that the war is failing despite what the president says. It is seen in Americans organizing for their right to know, and to re-affirm Freedom of the Press, under the banner WikiLeaksIsDemocracy.org. It is also seen in those standing up for Bradley Manning in the Bradley Manning Support Network. Join us. Do not feel powerless in the face of the American superpower and the manipulated U.S. democracy that prevents real change. It has always been small things that people do that leads to massive change. 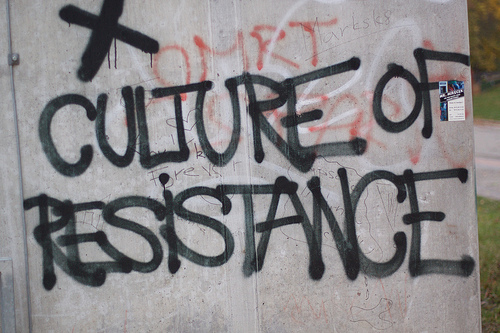 Everyone reading this can take action to challenge U.S. foreign policy, to help develop the culture of resistance that is essential to change. While the government has a lot of weapons at its disposal, its insecurity is evident in its reaction to the truth. The government shows more than embarrassment, it shows fear -" fear of their own words being exposed and people knowing what they do. Everyday that a truth is revealed, the government looses power and influence. It is a problem of its own making, do not blame the messengers. And, while the U.S. military is the most powerful in the world, and the U.S. taxpayer spends as much as the whole world combined on weapons and war, everyone knows this truth -" it has not won a significant war in more than 50 years. Now, all this so-called superpower rests on a fragile economy that is in deep collapse and showing no signs of real recovery with a ship of state too dysfunctional to respond to multiple crisis facing the nation and world. The superpower is strong, but weak at the same time. These seem to be the signs of an empire that could collapse at anytime. As you act, and see others act, more will be emboldened. As Julian Assange said -" "courage is contagious." Be part of spreading courage. Join or organize actions of resistance wherever there is injustice in your workplace, your school or your town. Speak out against war and militarism. Join Operation LeakSpin, review a WikiLeak cable and write about it wherever you can. Join the Bradley Manning Support Network and WikiLeaksIsDemocracy.org. Help build the tidal wave or resistance that will demand real change the change the nation urgently needs. Kevin Zeese serves on the steering committee of the Bradley Manning Support Network and Voters For Peace, the organization he directs, is the initiator of WikiLeaksIsDemocracy.org.